Danny Meyer’s restaurants are among the most acclaimed and beloved in the nation: Union Square Cafe, Gramercy Tavern, Maialino, Blue Smoke, The Modern, and more, winners of an unprecedented number of James Beard Awards for outstanding food and hospitality. 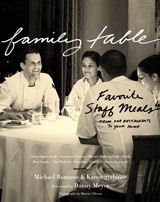 Family Table takes you behind the scenes of these restaurants to share the food that the chefs make for one another before they cook for you. Each day, before the lunch and dinner services, the staff sits down to a “family meal.” It is simple, often improvised, but special enough to please the chefs’ discerning palates. Now, for the first time, the restaurants’ culinary director, Michael Romano, coauthor of the award-winning Union Square Cafe Cookbook, collects and refines his favorite in-house dishes for the home cook, served alongside Karen Stabiner’s stories about the restaurants’ often-unsung heroes, and about how this imaginative array of dishes came to be. Their collaboration celebrates food, the family itself, and the restaurants’ rich backstage life. Some of the recipes are global and regional specialties: Mama Romano’s Lasagna, Dominican Chicken, Thai Beef, Layered Huevos Rancheros, and Southern Cola-Braised Short Ribs. Many highlight fresh produce, like Michael Anthony’s Corn Soup, Barley & Spring Vegetables with Pesto, Grilled Halibut with Cherry Tomatoes, Sugar Snap Peas & Lemon, and Plum & Apricot Crisp with Almond Cream. There are homey dishes like Turkey & Vegetable Potpie with Biscuit Crust and Streusel-Swirl Coffee Cake, and inventive, contemporary takes, like Cornmeal-Crusted Fish Tacos with Black Bean & Peach Salsa and a delightfully tangy Buttermilk Panna Cotta with Rhubarb-Strawberry Compote. What all these recipes have in common is ease and perfection.